I was really excited to try out these three colors. I just decided to use three fingers and see what the colors looked like. I absolutely love these colors! One coat of Zoya "Holly", Zoya "Charla" and Essie "Coat Azure:" If you look at this picture you can see that Both Zoya's colors are still a little sheer with one coat. The Coat Azure by Essie seems to be pretty opaque with just one coat. Here is a second coat of each. This is without a top coat: Charla is strategically placed between Holly and Coat Azure. 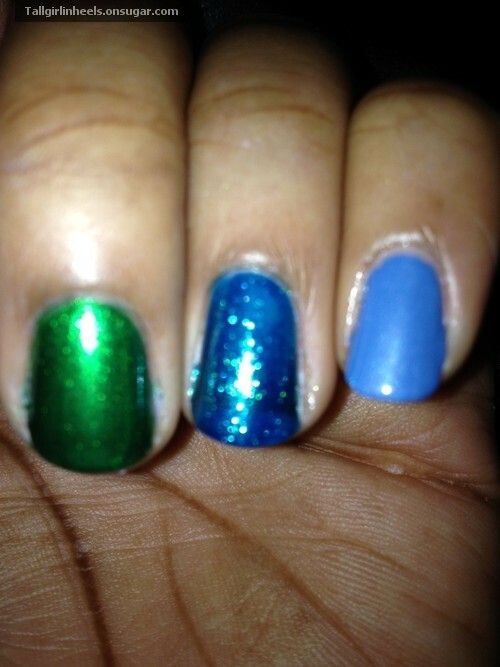 She is blue with the Green Shimmer, however the above picture does not show the green shimmer in Charla. Charla is actually my favorite out of the three. She is very shiny and the green metallic shimmer is so pretty in person. I tried several times to pick up the shimmer, but my cameras just would pick it up. Sorry.This last picture is with a Top coat. This top coat really does nothing for the colors. Holly and Charla both have a natural shine to them. I really love these Zoya colors. The Essie doesn't have a natural shine, but with a shiny brilliant top coat she too can have a little more pop! What do you think of each color? What is your favorite of the three?